Incredible Day of Surfing Opens WSL Barbados Surf Pro QS3000 | EasternSurf.com | All East Coast. All The Time. 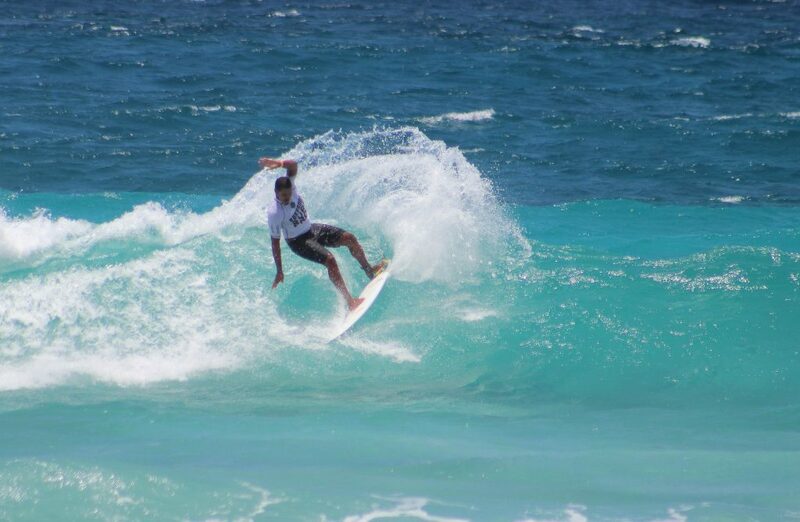 The history-making World Surf League (WSL) Barbados Surf Pro Qualifying Series (QS) 3,000 kicked off a great day of competition from both the men and women at Drill Hall Beach. Men’s Round One, along with women’s Round One and Two, were contested in two-to-three foot windswell that offered bountiful scoring opportunity throughout the day. Big performances followed from both the men and women to make this groundbreaking day in Barbados one to remember. Luke Marks (USA) raised the bar of what was to be expected with an 8.50 (out of a possible 10), but it was Cole Houshmand (USA) who unleashed on Drill Hall Beach with his powerful forehand and posted the day’s highest heat total of 15.73 (out of a possible 20). The two Americans had a big final exchange, but it was Houshmand who came out on top. The San Clemente, California-native had a tough result at the Martinique Pro just days ago and looks for a rebound here. After the men finished their Round One match ups, the women’s event immediately followed with Rounds One and Two before opening day was completed. Brisa Hennessy (HAW) dominated her Round One debut with an excellent 8.83, the highest single-wave score of the day, and immaculate 16.50 heat total — also the day’s best. The South Shore, Oahu native has her local break to train on and it showed brilliantly here at Drill Hall Beach. The 17-year-old just began her plans for a full QS schedule along with the Junior Tour and will be looking to for a big result here. Event organizers will reconvene for tomorrow’s 7:30 a.m. EDT call to determine an 8:00 a.m. start for either men’s Round Two or women’s Round Three. Tune in live tomorrow at 8:00 a.m. to witness more action and for more information on the Barbados Surf Pro QS3,000, go to www.worldsurfleague.com or download the WSL App to receive updates on your mobile device.